I'm starting to plan for this years Carlisle. I've registered. Also, just today I've got the general information page put together. I'll send out an email in the next week as soon as I can sort out the updates to my distribution list. There are a lot of great events this year with the 45th, the Fox-Body 30th, and so on and I know you can't make it to all of them. Even so, I hope many of you will consider coming to Carlisle. Today, I posed the question of a class just for feature cars at this years Carlisle to the folks at Carlisle Events. The question back to me was "would this encourage more owners to attend the show." I responded that I am in the process of the annual mailing to the people I know through this site about the plans for Carlisle. I will make sure to pose the question to that audience. In the mean time, what do you think about this? Are you planning to go to Carlisle? Would a class just for our cars move you to attend when you otherwise would not? Any feedback appreciated. I heard back from them yesterday and they told me that if we get 10 cars registered by the early registration date (May 18) we can have a feature car class. Count me as ONE for pre-register. Man I wish the date could change! We will once again be unable to attend this year due to a date conflict. I am taking both of our 93's to Columbus this year to the Fox Body reunion. Which is the same date. Bummer. If anyone is planning on attending this event drop me a line and maybe we can chat at the event. Take care. For those going or thinking about Carlisle, it is a great event and John puts alot of work into getting the features together. Wow, that is ashame they scheduled both events on the same weekend fairly close in proximity to each other. Hope both are able to pull from different markets to keep attendance up. I am taking both of our 93's to Columbus this year to the Fox Body reunion. Which is the same date. I thought it was July for the fox body reunion? That should not be a problem! I am all set to go. Hotel is reserved, the kids are ready (bringing my 4 year old for his first car show and nephew) I have not pre-registered but will do it before May 18th. Only unfortunate thing, I have to drive to Tom's River NJ to pick up some more ZAINIO before the show!!!! She has not been hit with the stuff in well over a year but I am out of the detailer spray and need it in my waxing regiment. That's awesome Ken. I should have also mentioned in my update that I am staying at the Fairfield Inn & Suites Carlisle. Excellent! We are staying at the same place. Bringing the family? I'll be bringing someone along but I'm not sure who yet. My father, my brother or my wife and son. Well, I will have my seats done by then!!! Today I called the guy who did my top and confirmed he has the job to replace both front seats and rear with new leather, vinyl, foam, and the dreaded black piping. The issue with the piping is that it will be just a little wider then stock. I am going to have him give me the original leather to store for who knows what. Hope it turns out OK! We'll see at the show! Ken, I can't wait to see the new interior. I just yesterday had two 1993 yellow/white convertibles confirm that they were coming. That makes a total of 7. Made the "big boy" purchase this weekend.......bought my son and nephew Triplewhite t-shirts to sport at the show. Looking forward to it and seeing everyone again. Hopefully the weather is a little cooler then last year! I got the confirmation yesterday on the tent reservation. So, again, we'll have some shade if it's hot. AWESOME! Let me know what I can donate to the tent fees. 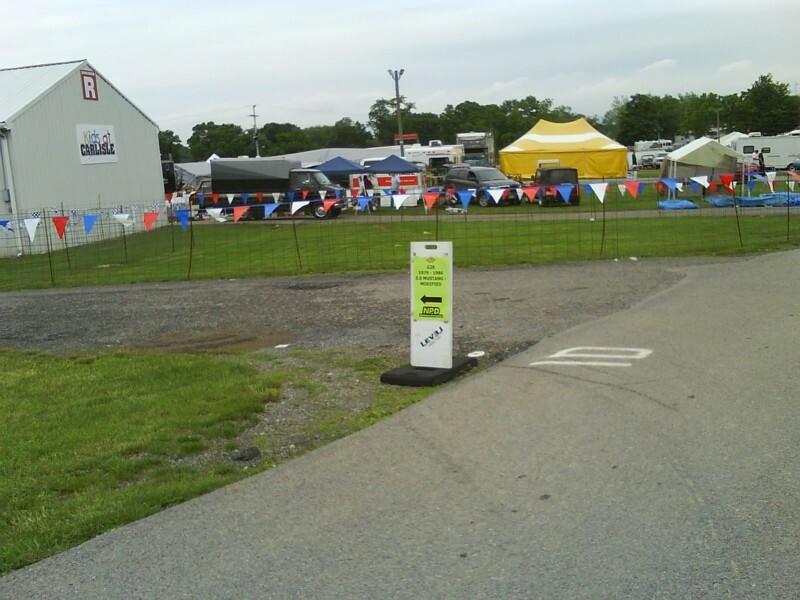 To be honest, the tent is really "key" for a weekend at the show. It offers a place to park in the shade and also gives our club a more upscale look if that makes sense. It seems only the large established clubs have tents.....wait ,what am I saying, we are well on our way of being largely represented and we already are established!!! I know we need 10 feature cars to have a class of our own and so far we have 7 going with TWF, but how about the feature cars that show up without any club affiliation or the yellow 93's who pledge allegiance to YMR?? How is there any true way for the folks at Carlisle to know about the total number of feature cars that register for this event if they don't mention TWF when they register? Last year I took my 97 GT vert and saw about 5 yellow's with YMR and I think 4 other feature cars spinkled about here and there so I am almost certain we will have over 10 features at the event. Also, John, is the tent for parking under or just for humans?? All clubs are required to display a banner at their tent with their club name. We ask for the banner so that we can judge the Coolest Club Hangout Award, which was a hit in 2008. The Coolest Club Hangout Award will be presented on Saturday morning to the club with the most creative club tent display. In addition to the display you must also be an example of what Carlisle Events is all about: HAVING FUN! The Coolest Club Hangout award is a groovy banner for your club to proudly display at Carlisle, at your home gatherings and at any other events your group attends. Any ideas on how we can make our tent different are welcome. The deal that was put forth was for 10 cars registered with our "club". As you mentioned, there have traditionally been other feature cars that show up either individually or with other clubs. In the past I have sought them out and suggested that they might want to park with us. This works best on Friday so they can park near us on Saturday. It's also is a bit of space management issue on Saturday as our "club" members show up expecting to be near us but some space is taken by the last minute additions. Luckily everyone has been cool about squeezing in. Technically speaking, if you park with a club you are not being included in the class judging. This actually turns out to be mostly a logistical restriction. Some clubs like the YMR cover cars from many classes. This judging restriction is not communicated to participants who do the judging. So, for example, no one says "you shouldn't vote for that car because it's parked with a club." The "restriction" comes into play because most likely, when you are voting for cars in the 87-93 5.0 Mustang class you might not realize there are also a few parked a couple rows over with the YMR. Luckily for us, our small size has allowed our club to be located right within or next to the class that our cars are normally associated with. So as people walk though that class they cross into our club. Of course, they could change that arrangement and have us located away from our traditional class. So, hopefully if we have our own class, other people with feature cars will either realize there is a feature car class when they are registering on site or it will be pointed out by the staff. Honestly, I don't remember just how I ended up in a class last year. I think it was decided when I got on site and I had some input. On the 19th, I'll email Rick M. with our list and also mention that likely there will be others. We'll see what happens. So, here we are on May 18th. Boy it came fast. We are still holding at 7 cars registered. Remember that we need 10 pre-registered by today in order to get our own class. Sorry to say guys, but i dont think i will be able to take the stang this year. Its very weird, but i think my headgaskets are leaking. I kind of suspect that this problem was present at the time of the purchase of the car and has slowly beein getting worst. But in any case, im misteriously loosing coolant and my overflow tank is bubling, plus i get that burned coolant smell from the exhaust. So im going to tackle the job asap, but i dont think i can make it before carlisle. I might still attend the show, but probably in one of my tbirds. Regarless, i'll stop by and say hello! And probably sport a TWF shirt! Definitely be sure to stop by! My plan is to arrive in Carlisle on June 4th. In the past I have been able to go onsite to locate our assigned location on the Thursday before the show kicks off. I suspect that it will be near the 87-93 Mustang class we will all be assigned to so you are probably OK following the Carlisle staff's general directions on how to find your class. On that Thursday night I plan to post details in this thread on our exact location on the show field as well as to directly email everyone who has confirmed with me that they are going. Steve, wish you could be there as well. All, I just found out the Official Event Directory is available. Hope all of you have a great time. Thanks for linking the event directory. I sent this out to the confirmed attendees but though it would be helpful to those coming last minute or just as spectators. The weather looks questionable for Friday but great for Sat./Sun. I thought it would be helpful as you arrive to know where we are located. 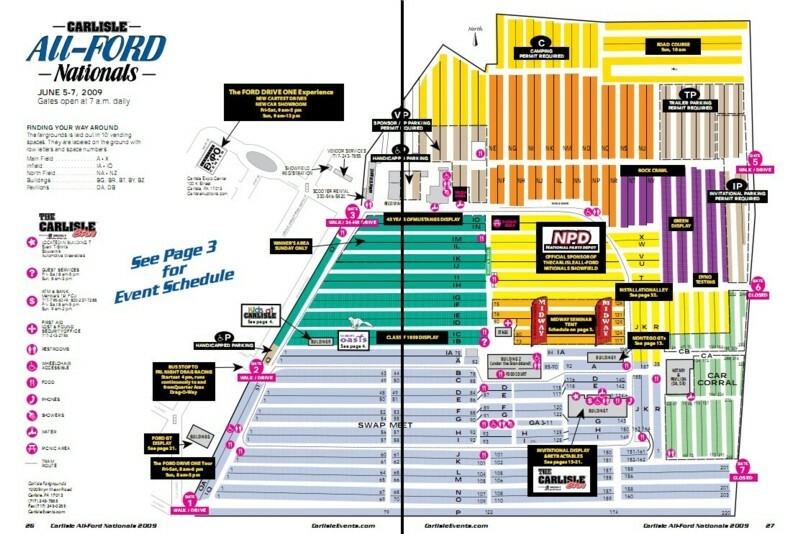 The show field staff will direct you to the location of your class which is most likely G29 (87-93 Mustang 5.0 Stock). And, that's exactly where you needs to go. We are in row 1D. The start of the row is G28 1979-1986 5.0 Mustang Modified. Continue down the row about 1/4 of the way and you will see a sign on the left for G29. Our tent is about 50 feet beyond that on the left. The tent is plain white. Across from us is the Kids at Carlisle and Women's Oasis tents. Our tent is marked in the map below with a fox in the green area. I posted my wrap-up over in my blog. I would first like to say that it was a pleasure meeting everyone in Carlisle (or for John, in CT)! All of you were very welcoming and a blast to be around. We shared a lot of stories and had a great time! As many of the attendees know, I have "just a little" addiction to Mustangs and am very partial towards the yellow ones. Well, after talking with a few of you, I've decided that I will eventually (after I finish up my SSP's) start the hunt for a yellow with black interior feature car! For those interested, please feel free to visit my site, as I have a small blurb about my first Carlisle experience and 286 photos uploaded. I haven't added the flash photo or added photos to the article yet, but at least it is up there to see. Will work on making it more appealing in the next few days! A big thank you to John for organizing the event and for convoying out with me! Joe, thanks for joining the site. Those are some awesome pics on your site. It's a very complete representation of the show. I can't wait to check them out more closely tonight. I'm sure I'll be contacting you to get some in full size if that's OK.